Whats4lunch (Nick's Guide to Grub) | Do you ever ask yourself…? Posts from Previous cone days here. Freebies on your Birthday ? 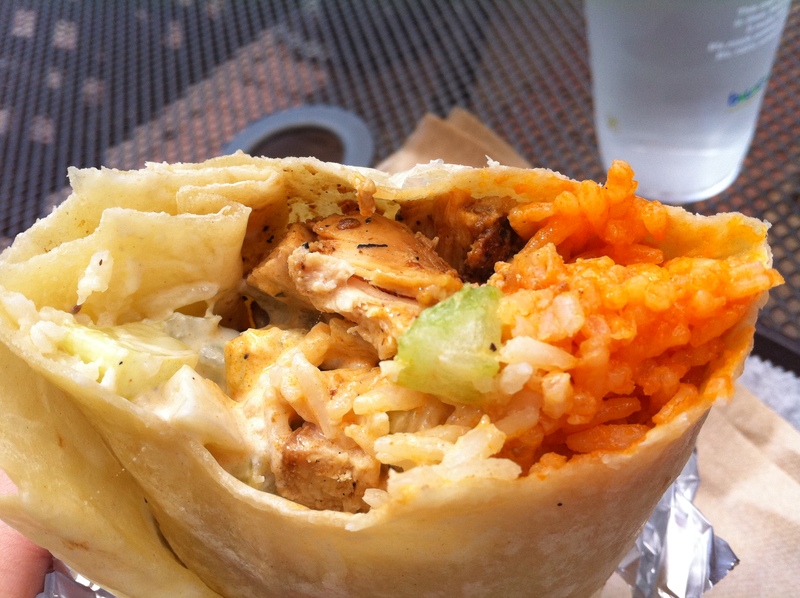 Boloco will give you a free burrito on your birthday if you sign up for their free loyalty card. Ben & Jerry’s will give you a free ice cream cone on your birthday (I managed to get a small waffle cone). Madison Square Garden can seat 20,000 people for a concert. This blog was viewed about 63,000 times in 2010. If it were a concert at Madison Square Garden, it would have performed about 3 times. In 2010, there were 8 new posts, growing the total archive of this blog to 116 posts. There were 16 pictures uploaded, taking up a total of 11mb. That’s about a picture per month. The busiest day of the year was May 18th with 372 views. 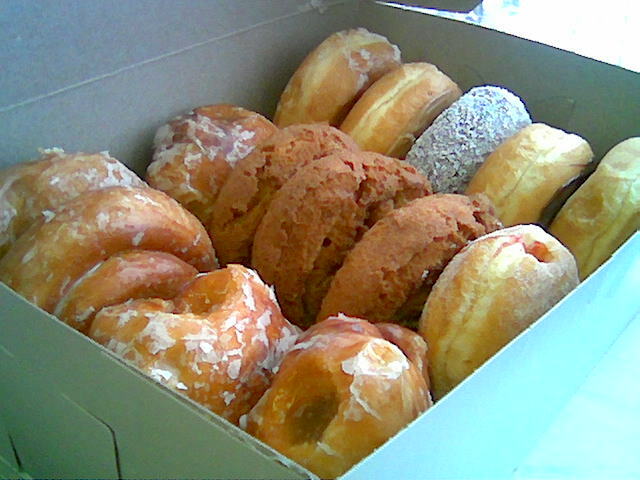 The most popular post that day was Rivers Edge Coffee Shop and Grill, “Dozen Donuts”. The top referring sites in 2010 were en.wordpress.com, sadiekatzdeli.com, search.aol.com, hongsdumplings.com, and facebook.com. Some visitors came searching, mostly for general tso’s chicken, donuts, hush puppies, chile relleno, and pesto pizza. 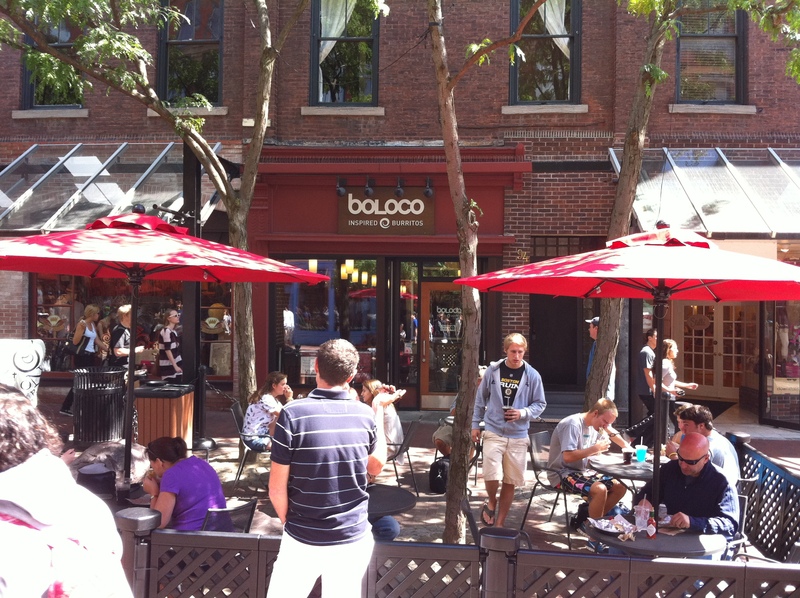 Boloco is a ‘mini-chain’ with its’ only BTV location on Church ST. Boloco is a portmanteau of Boston and local. Initially I thought it was some mash-up of loco (crazy in spanish) and burrito (small donkey). Boloco has requisite outside seating for the summer. Boloco’s default chicken is thigh meat AKA dark, which means there is more chicken flavor to the meat, similar to chicken wings. The buffalo wing theme is continued with celery, blue cheese dressing, and Frank’s Redhot sauce. The rice serves as a base to collect the sauces. I’ve taken to ordering this wrap with brown rice and whole wheat tortilla to health it up a half step. Only negatives to this wrap are the lack of local ingredients and slightly gummy average tortilla. 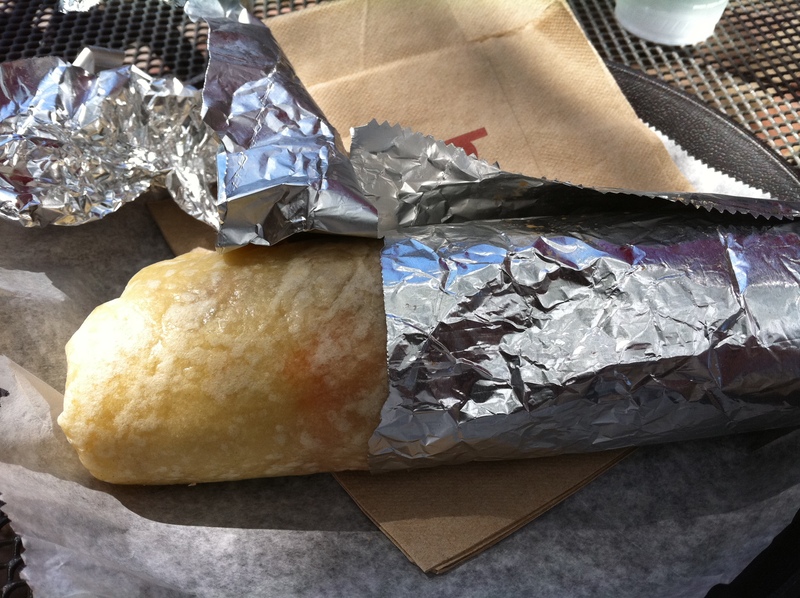 One of the things Boloco touts is their peel and eat model of foil wrapping, which is said to increase mobility. At least for the ‘original size’ I don’t foresee myself walking done the street eating this, as I won’t be encompassing the circumference of the wrap in a single bite. Inexpensive at $6.94 with tax and they have a ‘sandwich club’ reward card if you plan to frequent the establishment. Of note: they also have smoothies. Free cone day today 12PM -8PM. Check out the madness from last year. 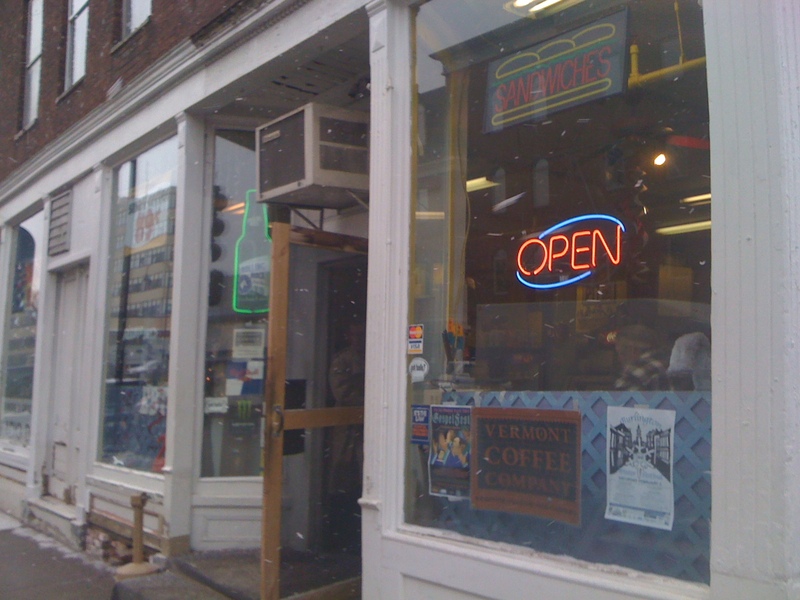 According to WCAX local Olympic snowboarder Hannah Teter will be scooping her “Maple Blondie” flavor. I love Alice in Wonder Land / Through The Looking-Glass so the Mad Hatter Deli already is a win in my book. In addition to sandwiches, they bake cookies, which you can see in the Window. The cookies are $.70 per (cash only). These cookies are about texture (notice the artisan spiral shape on top of cookie). The cookie has a some what hard on the outerlayer, and soft interior. Upon biting the cookie, it immediately breaks off a chunk without the crispy-cookie report. The soft interior (pillow) mixes well with the raspberry filling, for almost a cake-like feel. There’s something different about it. This cookie may be in the running for best cookie in town. Speaking of wings, (Zabby and Elf’s) Stone Soup have great wings as well as a great self serve buffet. You pay per weight of the plate and as pictured it was $9.91 with tax. 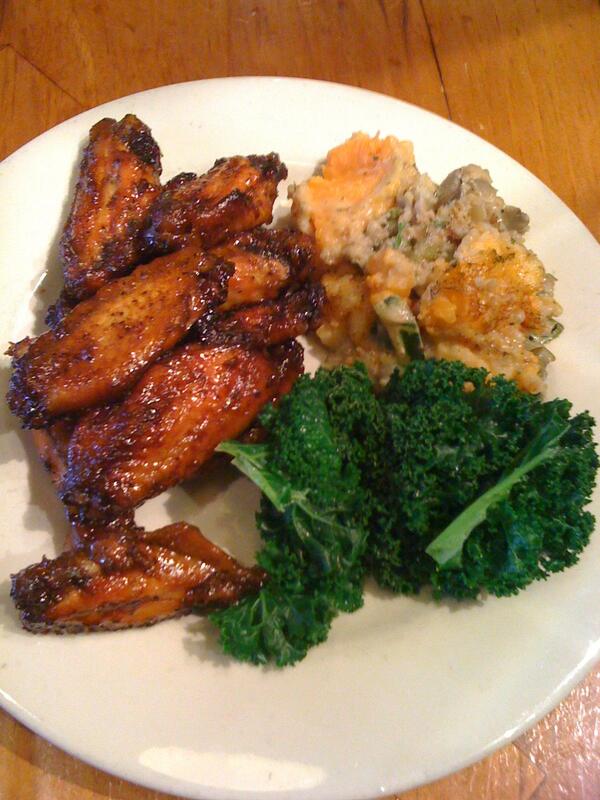 Pictured are Misty Knoll “Sweet and Spicy Wings”, tamale bake, and steamed kale. The wings appear to be non-traditionally baked instead of deep-fried, but the fat is rendered and the baking results in a higher TTL (time to live) window of deliciousness. The sauce is mildly spicy, and the sweet isn’t cloying, there is a great balance to the flavor. The meat is very tender, falling off the bone, almost like BBQ and the texture is nice when biting into the wing. The tamale bake and steamed kale were also great, It’s easy to try to balance the wings out with good vegetable items via the buffet. Lastly the wings are only on Thursdays and Fridays and make sure you wash your hands after eating, as the wings make your hands sticky. Don’t forget it’s cash-only. 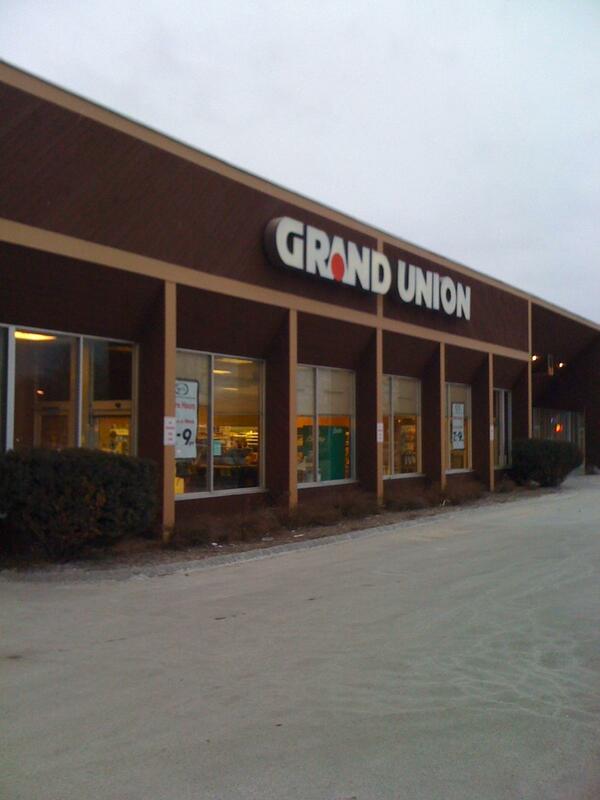 When I heard the Grand Union in Swanton Vermont was closing, I took a trip up there for hot wings and “potato logs.” Grand Union (different location) was my first introduction to hot wings, and the potato logs (battered, fried giant french frys). I unfortunately didn’t take an pictures of the hot wings and they were sold out of potato logs, but if you happen to be traveling near one of their remaining locations try some at the deli department. Radio Deli is a lunch spot I like to hit up on Pearl Street when going to the post office or the mall. The proprietors are very funny conservationists and seem to be serious about providing good, inexpensive food for their customers. I saw Cabot cheddar mac and cheese on Radio Deli’s blog but it was sold out by the time I got there. Instead I got one of my standbys “chili over rice” which comes with optional cheddar. 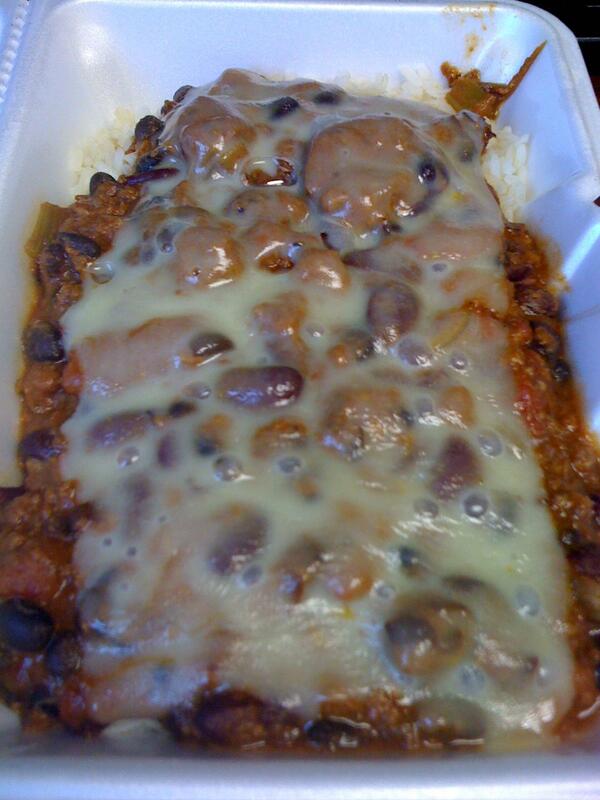 It’s got a little celery, onions, green pepper, as well as lots of beans, meat and stewed tomatoes. The rice is white, and not over cooked (kudos). 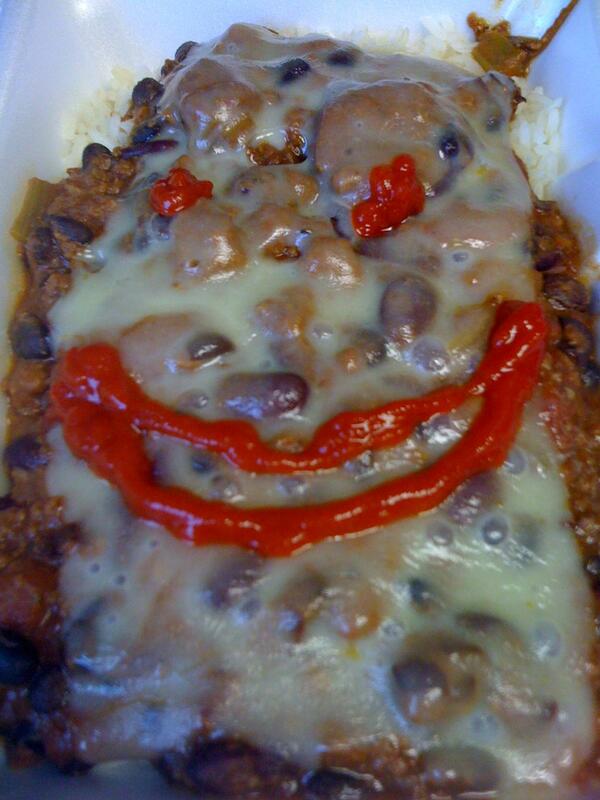 I’ve found that the chili is much happier as pictured with the addition of Sriracha. The chili over rice is a great value @ $4.75 pre-tax. 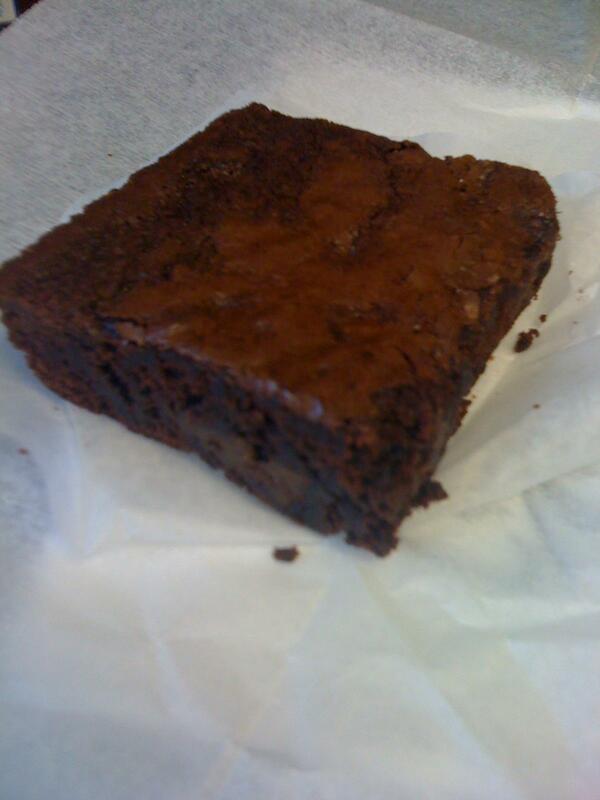 Radio Deli takes their brownies seriously, and this is easily the best brownie for the money in town @ $.99 pre-tax. There is the key micro crispy top layer, as well as small chocolate chunks to break up the texture; Well done Radio Deli. 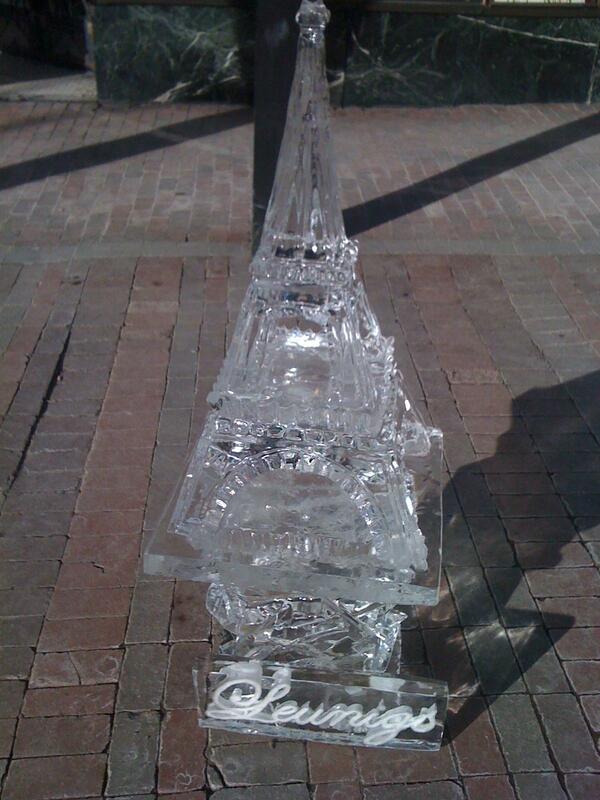 A good reason to eat lunch downtown today is to walk around and check out some cool ice sculptures.